I did a similar thing with The Sims 2, and it just got more bizarre as the expansions came out. I created a family of Vikings, a family of ninja, a family of superheroes, and a large group of roommates all dressed in medieval garb with the names of Arthurian knights. I suppose, in keeping with the thesis of this article, this is the equivalent to a sitcom getting more and more cartoonish in its plotting and characterization as the seasons go on. The neighborhood kept growing, and as it did, my families had offspring—all of whom were horribly deformed, because I gave their parents cartoonish features—and then the offspring all started interacting, so that a Viking boy starting dating the ninja girl, and Sir Lancelot was carrying on an affair with the superhero mom. It was basically the same thing that happened whenever I took out all my Lego sets at the same time, only it was on a computer and I deliberately avoided taking control of most of it. 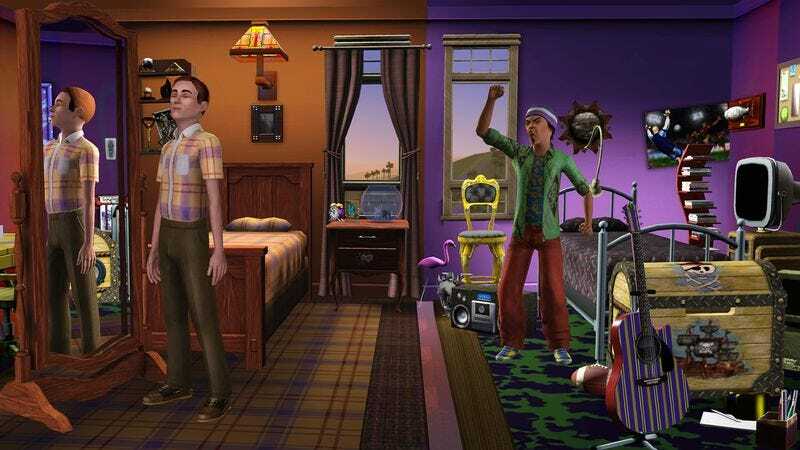 That’s another thing that makes The Sims the ultimate anti-game: It gets more interesting the less you try to “play” it. I recall making a model nuclear family in The Sims: father was a businessman, the mother was a cop, the two kids were perfect straight-A students. Then one fateful day, I made a decision that changed their lives forever: I bought them a grill. After approvingly gibbering at the new purchase for a while, the father decided to grill up some dinner. He might as well have been cooking steaks on a landmine. Within seconds of lighting up the grill, it exploded and surrounded him with an inescapable ring of fire. He was dead before the mother could even make it to the phone. The family took the loss hard. The mother lost her job at the police force and turned to a life of crime. The children were too depressed to maintain their grades and the son was eventually shipped off to military school. The moral of this story: Never trust a grill. Back in my freshman year of college, there was one computer that was used almost solely for The Sims, and it was used by a bunch of people on the floor. We all used the same neighborhood and had our own characters. Mine was a fat man who lived alone in a tiny house and really did nothing but paint portraits of himself painting himself in his underwear. I also decided to have him destroy the family of the owner of the computer. He slept with my friend’s character’s wife, painted them standing around together in my character’s disaster of a home, and I would routinely take screen shots of them in the process of Sims-love and make them the desktop image (after taking a screenshot of the desktop, making THAT the desktop image, then deleting all of the shortcuts, of course). The wife got pregnant, the resulting kid was one of the ugliest things I’ve seen The Sims produce, and she was ultimately shipped off to military school. Our Sims hated one another (and my friend wasn’t too happy with me for a while), but all the differences were set aside because my Sim was really good at playing the bass in his underwear, while my friend’s Sim was very good at playing the drums. There is an enormous wealth of European folklore and myths that were never touched by games. (The same is true for Japan and North America, I’m sure.) I regularly lament the fact that virtually all regions in Europe would be a treasure trove of extremely interesting creatures, concepts, and settings that virtually no game ever has included in their worlds. Games really are not that inventive when it comes to picking their influences. It’s still very much a Best-of reel of myths done to death in (mostly popular) culture. I love the few exceptions, though: Year Walk, for example, a game that not only cherishes the deeply obscure (in every sense of the word) folklore of Scandinavia but also plays with that very obscurity in an interesting way; or The Domovoi, a Twine text game that uses an old Slavic myth to comment on the disastrous rapport Soviet Russia had with its past; or the first Witcher game, which was, to me at least, weirder and more interesting than its more polished successor. At times (especially in the strange intermezzo that is its fourth chapter), The Witcher comes close to being the rare European role-playing game that embraces the possibilities that the regional folklore offers, and it’s all the better for it. The archipelago this takes place in is full of creatures never encountered before and after, and people that talk about and with those creatures. (Coincidentally, the second game’s bestiary is not only less interesting but also a lot more restricted.) It’s also where two quests take place that are narratively more interesting than almost everything the Witcher games have done since: In one, you fight the Wild Hunt, not by the way of the sword, but with a ritual; in the other, you learn about doomed lovers and the fragile borders between the real and the spirit world. To me, for all the additional resources CD Projekt poured into their second game, they never succeeded in creating a place that felt more lived-in than this one—and I would argue that it’s because of how the land, the people, and the supernatural elements coexist in this place. I wholly endorse the idea of having collectibles that offer mini-info bursts educating you about something. The same idea was used to great effect in Valiant Hearts. In conversation, I still break out little snippets of info from that game about the Indian Army’s involvement in World War I or how the Canadians were the first to figure out how to deal with mustard gas (urine soaked rags!). The gameplay was serviceable but nothing special, but the background information about the periphery of life during WW1 colored the levels to make the final product absolutely fascinating. I legitimately learned a lot about WW1 that was left out of my American-centric education, which is fitting from a game that ends before the Americans even get involved in the conflict. Toad doesn’t feel like an officer. They should have made him a sergeant—the ever-reliable workingman’s captain. The joke from Galaxy is that he’s a Zapp Brannigan-esque leader who is barely able to keep his team alive and regularly surrenders to sloth and cowardice. They seem to have toned that angle down, though I like the idea that he moves so slowly because his greed has forced him to cram as much loot as he can into his backpack. That does it for this week, folks. As always, thanks for reading and commenting. We’ll see you next week!